Welcome to Old Brewery Antiques. You are now under the antique dolls page. Every girl has been fond of dolls for at least once in their life. The most famous ones will be the Bratz maybe, and of course, who doesn’t know about Barbie? Dolls are definitely the most well-known toy for all girls- but maybe not the antique ones. Antique dolls are most often collected, both by men and women, and obviously not be play with since it may be damaged and may loose its value as a result. 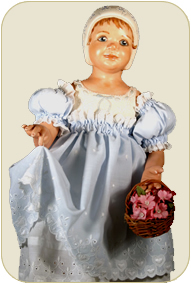 Antique dolls are surely a collector’s item to keep, and many in fact, have invested much with this kind of hobby. While some of these vintage collectibles are still of great shape in spite of their age, there are some of them in which their damages are noticeable already, because they are, in fact, too old to have been existed and preserved up to this very moment; but definitely, despite of the appearance, these dolls still cost a lot of bucks. Old Brewery Antiques offers hundreds of antique dolls for you to choose from. The items found in this page may not be limited to dolls alone, since you can also see here doll cabinets, doll’s dresses, doll house, and others which are related to them. Take your time to browse at each of the products that are made available for you. If it happens that your desired item is not accessible in this page, you can also try browsing on other categories, or better yet, make your own research by typing it in on our search box; and we hope that you’ll be able to find your desired item on our site.